You can get from us all the parts you need to make an exact replica of the Black Shot V-Rod. I want to buy an extension kit up to 300. I’m from Russia. How can I order? my bike – HD night rod 2010. We will reply to your email with a pro-forma invoice including shipping charges. Please note that all International orders must be pre-payed via bank wire transfer. Hi there Lorenzo , A question for you do you make or supply? Single arm swingarms for 2009 v rod Muscles I have a 240mm rear tyre and am seriously thinking of expanding this too the 300mm version .you have alot of interesting parts and accessories such as the brake rotor that i would also be interested in adding too this feature however i want to retain the belt drive ,nice and clean chains are too messy . please get back too me either here or with my private email that i supplied , thanks. Sorry, but we do not make single-sided swingarms. All parts for V-Rods we make are listed on this website. Hi. I have a 2006 street rod. Wanted to make a similiar bike. What all parts can fit on it. Please let me know. 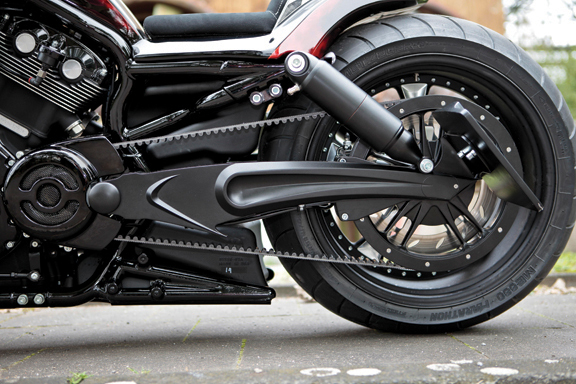 Thank you for your interest in Eurocomponents’ swingarms for V-Rods. 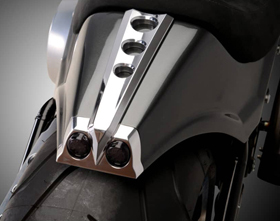 We can make all parts on the Blackshot V-Rod to fit your 2006 Street Rod. Please provide me a quote for Billet Aluminum Swingarm Kit (300 Tires) for 2006 Harley Davidson Nightrod (VRSCD) along with the freight to oman. and what are the other changes required for this MOD. 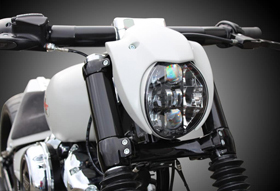 Swingarm kit in polished is $2476.24, in black is $2768.88. Of course you will need to change the rear wheel and fender to fit a 300 tire. Oh forgot to mention I have a 2012 muscle. And would like to do a one time buy from one seller rather then buying parts here and there. Trying to make it more simple. And what ever I need to finish this project. Sorry, but we do not offer a complete kit, because we have different wheels’ styles and finishes and the options are too many to include them in one kit. You would need to tell us wheels’ style, finish and sizes, braking system preferred (traditional or pulley-rotor kit), rear pulley width and teeth number, swingarm finish and we will get back to you with a quote. Hi there I have a v rod muscle I saw ur kit and its very interesting .nthe question is what’s to buy more to complet it . ?is there anything else or this kit is enough to be installed ? if I buy this kit and install it do I need to buy anything else ? 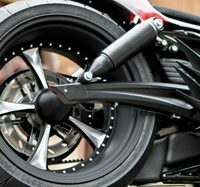 I would like to modify my 2002 VROD into a wide tire 250 tire , aside from the swing arm what parts do i need to achieve this modification. i would like a chrome plated swing arm for this project , and what other things/spare parts do i need and how much. I want to buy an extension kit up to 360. I’m from Bolivia. How can I order? My bike is – HD V-Rod muscle 2011. I saw your kit and its very interesting. .the question is what’s to buy more to complet it .? is there anything else or this kit is enough to be installed ? Thank you for your interest in Eurocomponents’ swingarms for V Rods. 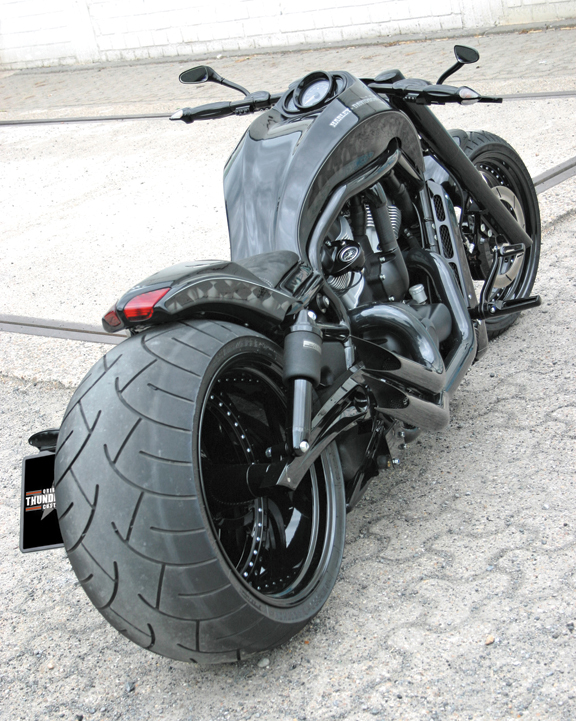 Sorry, but our V-Rod swingarm can fit up to 300 tires. We do not offer a swingarm to fit 360 tires. Sorry, but we do not have any dealers in Sweden or Norway. Please have your local dealer contacting us, so we can send them our New Dealer Application. If i purchased the stealth kit for my nightrod special do i have to purchase anything else besides the swing arm and the tire for it to be compatable? Thank you for your interest in Eurocomponents’ parts for V Rods. Actually, the Stealth body kit can be installed also on a stock bike. It is not mandatory to change the swingarm as well. Does that exhaust fit on a 2008 night rod? If so how much is it? Do you have other choices that would fit too? Sorry, but that exhaust system has been discontinued and is no longer available..
Could I possibly get the parts list and prices to build the Black Shot? I will email you the Black Shot V-Rod parts list in a minute. i am wrigting from Italy. i drive a vrod centenary and I would like to switch to a 240 mod rear weel (now as all the stock of the kind I drive use a 180). I have been reading many things about the difficulty to perform such an upgrade. My question is, can I do it? and how much would it cost to buy from you everithing I need (including shipping charges, fender, lighting: all except the tire? Installation is pretty easy, since these are bolt-on components, but much depends on your mechanical skills. We reccomend for all parts to be installed by a professional mechanic. As for the quote, please specify which style of wheels you prefer and in which finish you want them (polished or black). 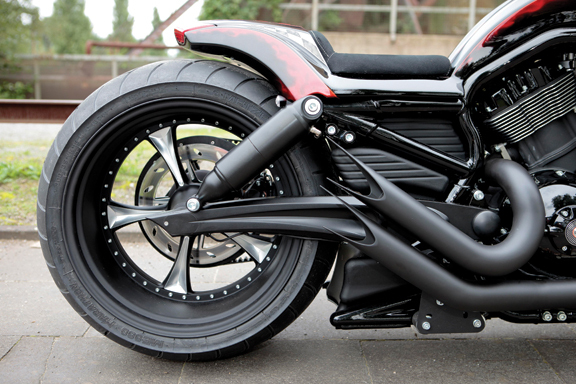 As for the rear fender, you can still use the stock one, you just need to modify the under structure of it. How much for a 360 wide tire kit? That’s what I’m looking for. 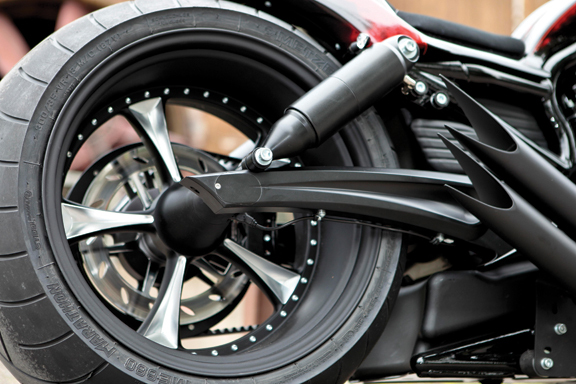 Sorry, but with the widest swingarm we offer is for 330 tires. I have a 2006 street rod and want to convert this to 280 rear with air ride suspension. Which parts will i need for this and can it be shipped to Philippines? No problem to ship to Philippines. Do you already have a list of parts compiled to replicate this build?? Very interested. do I need to buy any other parts for the conversion or does the kit include everything I need for the bike? 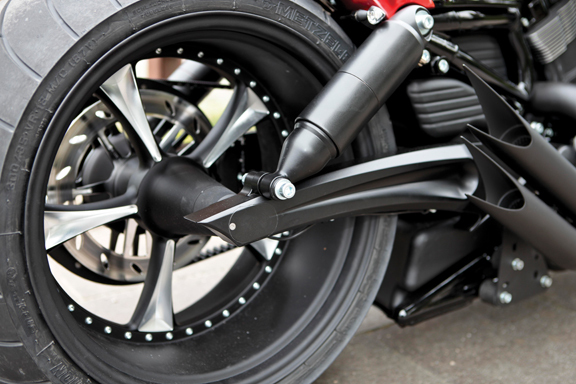 The following parts are not included with the swingarm and you will need to purchase them separately: front offset pulley, wheel, rear pulley, rotor, tire and rear fender. As you can see on the website, we have different options for the parts you mentioned, which have different prices. You can find all prices on the website. If you want us to make a quote for you, please supply either part numbers or accurate descriptions of the products you are interested in.